A press release informed me that Rebecca Mascarenhas (who's she?) was opening a new restaurant called 11 Abingdon Road in, believe it or not, Abingdon Road, near my house in Kensington. 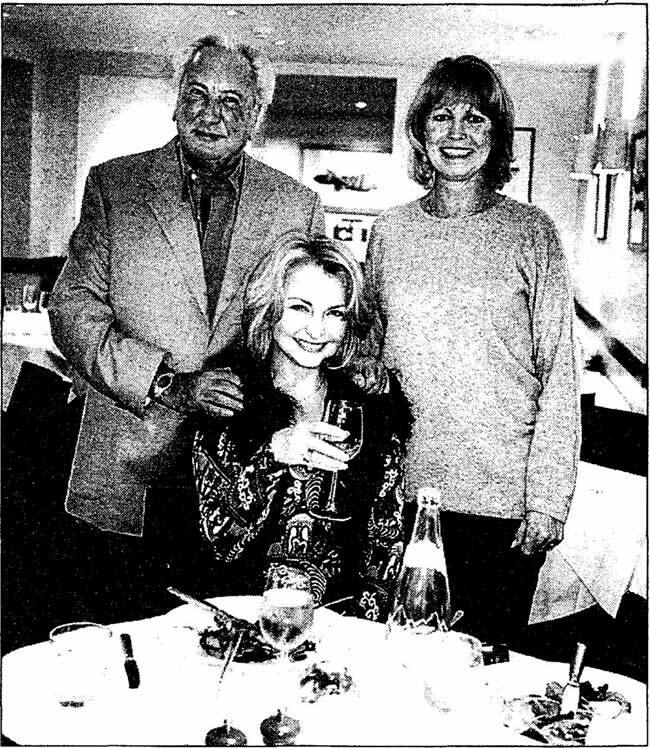 I went there for lunch with my lovely receptionists: Dinah May - ex-Brookside actress and Miss Great Britain - and Joanna Kanska - ex-TV star of Capital City and others. The man who took my telephone booking was surly and ungracious. Why send press releases if you can't even arrange a polite customer greeting? We arrived at 12.50pm. There were five people present. We selected a table and rustled because their paper tablecloths draped over the edge of the table. They make a noise whenever you move. The waitress spoke so quietly in a foreign accent that we had no idea what she said. "She might be Hungarian," suggested Joanna, "I know a Hungarian song. I can sing it to her." We got four little bowls of butter for three people plus some very ordinary bread. Then we waited. And waited. "She's snotty, that waitress," I observed. "Not a bit friendly," added Dinah. "Yesterday in ASK all the staff were smiling." The ladies opposite us, who came in after we did, got their menus. After 15 minutes our menus arrived. "Beyond belief," I muttered, "we eventually get to order." There were now 12 people in the place. Forty-two minutes after we arrived we'd had nothing except bread and water. "What's happened?" I asked the waitress. "I'll go to the chef," she said. The lady opposite asked: "Did you order slow-cooked hare?" After a wait of 50 minutes three plates approached. Two extremely dreary risottos and smoked salmon for Dinah. "Boring food," said Joanna. Then another long wait with no sign of the main course. "They've got to do something about it," said Dinah. "Close the place down," I suggested. At two minutes to 2, one hour and eight minutes after we'd entered, the main course was served. Joanna and I had liver, which was very good. But it was accompanied by boring salad and cold pumpkin. The two ladies next to us got up. "You can't go!" I exclaimed. "You've got to take our photo!" "Do I get a credit?" asked one of them. "Absolutely!" I said. Her name was Wendy Allen. "You work nearby?" I asked. "Yes, I'm with an introduction bureau," explained Wendy, handing me a come-on which read: "This card is designed to attract men . . . intelligent, educated and unattached." "Do I need you!" I exclaimed. Well, I qualify on unattached if not on educated and intelligent. Wendy's agency is called Drawing Down the Moon. The card said I could save £200 with it! "You may see me again!" I threatened. "But to attract women we'll have to send out someone else's photo." Most of the diners had gone. "We've been here an hour and 20 minutes and we're nowhere near ordering our desserts," I announced, calling for the plates to be taken away. Eventually Dinah got caramelised rice pudding with roast quince. Sounds good. Tasted of nothing. "It could be porridge," observed Dinah. My dessert was floating island with creme anglaise and hazelnuts. It also tasted of very little. A woman, who seemed to be the manager, said: "We can do 100 people comfortably." I felt like saying: "What are you talking about! You can't even serve 12 people properly!" But I just paid. Joanna still had her coffee. "Can I bring it with me?" she asked. "Anything to get out," I muttered. I doubt if anyone in history has written more about a hotel than I have concerning Sandy Lane in Barbados. I've sent hundreds of people there, and been myself for the last 24 Christmases, not only paying full price but booking directly. That means the hotel doesn't have to pay a hefty travel agent commission. I've never had as much as a free cup of tea. So I was a bit surprised when their new chief executive, Michael Pownall, blew into London and didn't even phone me as his predecessors, and other hotel bosses, usually do. I'd never met him so I assumed the hotel's public relations group, Ann Scott Associates, would ask me to their party for him. They didn't. Apparently Ann Scott considered my visits to Sandy Lane were private. I'd say they're the most written about and publicised visits made by any hotel guest to any hotel in the world. But Ann did me a favour. I regularly bin invitations to press parties for hotels and restaurants. I'll be satisfied with attending any "do" given by Sandy Lane's principal owner, Dermot Desmond, the most charming of hosts. There, mercifully, no journalists are to be seen. I totally agree with your opinion about the redecorated Dorchester Grill Room (Winner's Dinners, November 13). It's like a tackily themed Scottish restaurant. You'd expect it in Alton Towers or Disneyland, but not the Dorchester. Perhaps someone was flogging a job lot of cheap tartan in Oxford Street and the Dorchester manager thought: "What a great idea!" Luckily the Sultan of Brunei has enough money to redecorate it again. I hope he reverses this travesty! I had to laugh when you said last week you thought £75.38 was an expensive lunch for two. Please, please come over to Dublin and review some of our overpriced, overblown restaurants. It would thrill me to pieces if they were taken down a peg or two. They say money can't buy happiness. It seems it can't buy style either. Three thousand pounds for your jacket (Winner's Dinners, November 13) yet you and your companions still manage to look like a gang of plumbers on a golfing trip to the Algarve. I offer my apologies to plumbers. Are the managers of Glade blind, insane or just amateurish? In last week's photo the two waitresses had long, unkempt hair, which should have been tied back - and no arguments. I would find a lapse of that kind infuriating in the lowliest of greasy spoon cafes, let alone in Mayfair's finest! A brochure for the Salt House in St John's Wood mentioned pan-fried foie gras with mango tartlet. I phoned to book for the following day to be told foie gras was struck from the menu. The girl explained: "There are no mangoes." "Can I have foie gras by itself?" I asked. The girl retired, then returned and said: "Yes." When I arrived I said: "I've already ordered foie gras." "It's off," said the waitress. "I was told I could have it without mango," I responded. I summoned higher authority. The manager, not a specimen whose looks or charm would cause the many attractive girls present to queue up, said: "We've not had foie gras on the menu for over a month." My irresistible force had come up against an immovable object.